Lions and flowers and sequins, oh my! The day after the 4th of July marked the beginning of Paris Haute Couture Fashion Week 2010. Among my favorite designers at the show were Dior, Chanel, Valentino, Armani, and Givenchy. 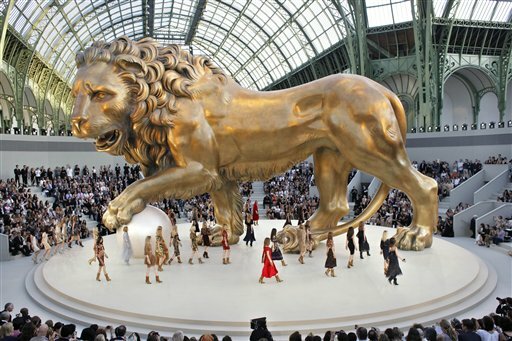 Even though it seems haute couture is on the way out and ready-to-wear is definitely here to stay, each designer presented something to beautiful to ooh and ahh at. Head designer Karl Lagerfeld was one of the stars of the show, as he rocked out the runway with a giant 30-foot gold lion in the center in honor of the late Coco Chanel who was a Leo. His designs were fresh, fun, and colorful: not a LBD in sight. His reasoning? "All women already have a little black dress." 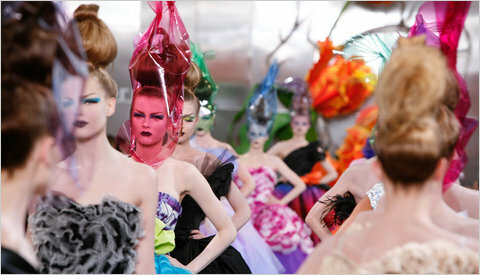 John Galliano, head designer for Dior, pulled out all the stops with his floral explosion on the runway. Colors, cellophane, petals, up-dos that resembled bouquets; there wasn't anywhere that he wouldn't go. He took a risk and it really worked, as he comes in a close second for best collection (in my opinion) behind Chanel. Showcasing of the most intricate collections I've seen in a very long time, I'm really impressed with the work of designer Riccardo Tisci. One of these evening gowns took 1400 hours to create; some cost four or five times the amount of the annual UK salary. If you look closely at some of the beadwork, you might be able to understand why. The Giorgio Armani Prive: Forever Amber collection had a few pieces that I absolutely adored (the white jacket and dress in particular), but on the whole, the one-hue theme didn't really do it for me. You can see the whole collection here, but I've posted my few favorite designs below. It seems as if time and time again, Karl Lagerfeld is proving to me why Chanel is one of my favorite designers. On the whole, the show was beautiful to watch and even a couple glaring mistakes in a few collections doesn't change that. You heard it here first: one day I will be in Paris for Fashion Week and be able to recount it for you first hand. Until then, secondhand photos will have to do!